Ok, so you should realize that there are no Giants out just yet, heck the game isn't even out yet! But, with that aside, things have started to take place revolving around Giants and that has peaked my interest...with good reason too. I have been too busy to update the blog, or really do much of anything video game related, for several weeks now. A lot has gone on...Just because I'm not getting to update here, upload vids, or what not doesn't mean I'm not interested...oh quite the contrary my friends! All this time I still look for variants. As slim of a chance as it is to find one, it happens. It has happened to me, and it continues to happen to others. You just never know...and that is what drives me. The last 3 weeks things have really gotten interesting. More and more Giants items are going up for pre-order, getting butchered (Amazon Flameslinger, cough, TRU breaking the street date on the Dragonfire Cannon Battle Pack etc), and of course...stores getting their displays oriented for the influx of Giants!! But before we go there, let me start with this observation...granted, I WANTED to post it about 6 weeks ago, but oh well. Look how noticeable the green is on Stump Smash. It is like a super bright green below his mouth, on top of his stump fists, and then the base is a really dark green. If you've got an "old" Stump Smash this is a huge difference. I really like the early release better. You see this with others (notably Target Exclusive Whirlwind and Walmart Exclusive Drill Sergeant, but that was subtle). This is a BIG DIFFERENCE. I didn't get pics, but tonight when I thumbed through the Giants display at Target (more on that later) I saw a very dark blue Slam Bam. My Slam Bam (looking at him on the pool table right now) is like an "ice blue." Not sky blue, but a translucent, medium blue. The one in the Empire of Ice APs I saw at Target and TRU tonight were all dark...think along the lines of Blue Bash. Don't anyone get riled up...these are NOT variants. 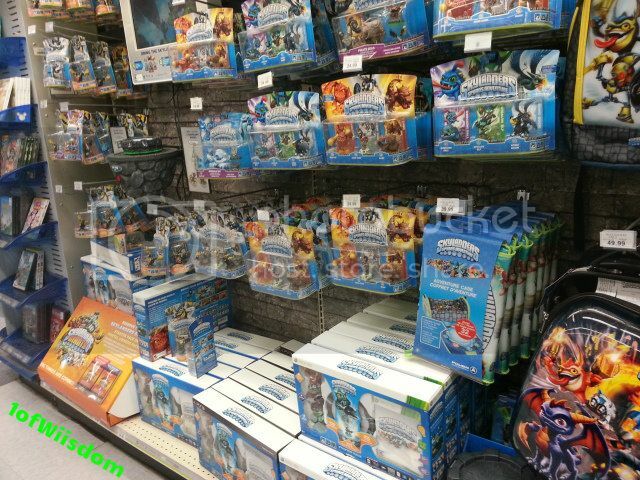 That said, if you are, or know, an astute Skylander collector, they may be worth picking up. For everyone else, don't bother. 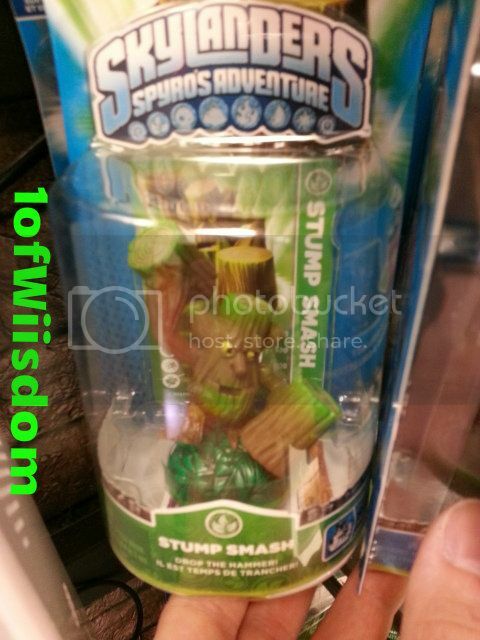 And please, if you do not have Stump Smash...just take this one...don't go out and track down a "new in box" Stumpy from last fall for 5x retail. It is not worth it! So, for those of you veteran hunters out there you likely immediately gravitated to Wham-Shell. This is honestly about the 4th time I have seen him in retail...ever. For what it is worth, Zap has also been extremely hard to find in Single Pack form. You will also notice Ignitor. And if you must ask, yes...I did find Camo and Lightning Rod hidden a few pegs back. But, if you followed the blog, you might notice the stray single packs to the bottom left. Two new hooks appeared this day and I made a point to get them in...Up top they were covered by the usual Wii accessories. What? More blue space? Yeah...empty, waiting blue space that is. Note how everything has tidied up and shifted left. In addition to the cases showing up, we now have Triple Packs all the way left. 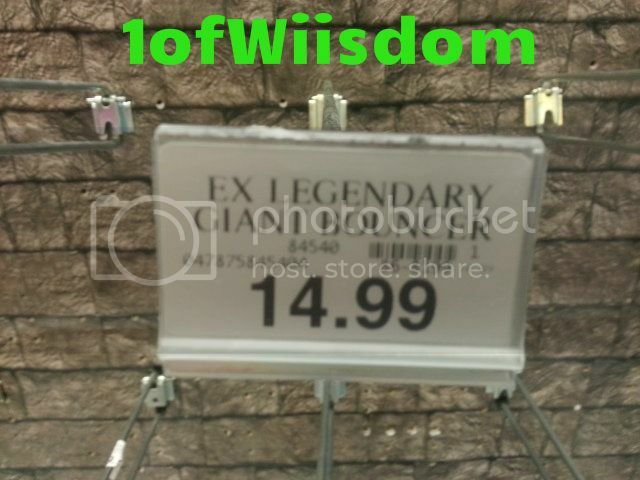 The original display at this store covered only the "bricked" segment. The "blue pegboard" was always Wii accessories. 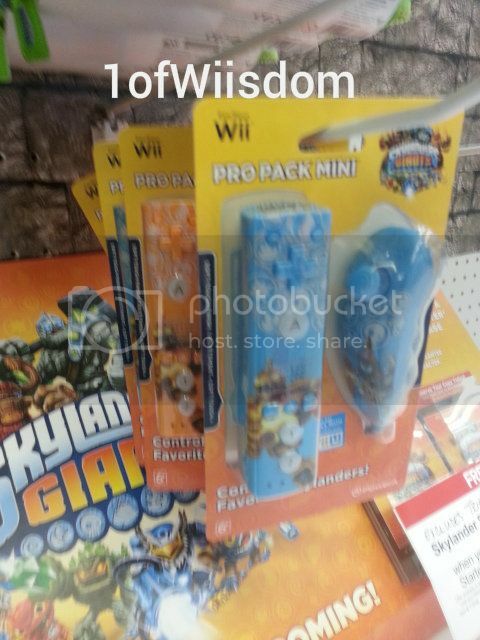 Trained eyes will also notice the presence of the Skylanders stylus in the top left as well as what is a very sparse selection of Giants reservation cards (the game, not a figure). Yep, my store finally got the Giants display! The thing is, I wasn't even aware of it. 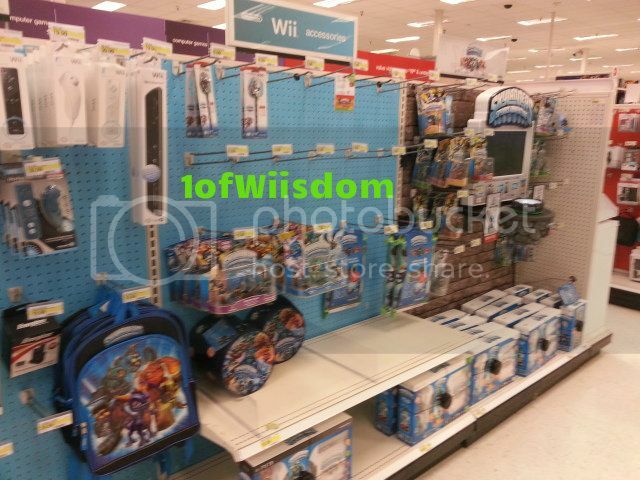 Apparently Activsion has taken to end-caps, at least at Target. From the video game section, I was exiting and saw an end cap (right past where I was standing). I skimmed it and found nothing. 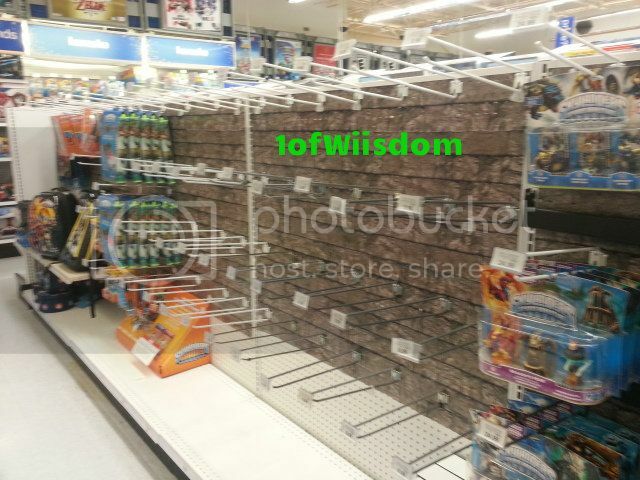 As I was leaving that area of store I turned and diagonal from this "new end cap" was the "Giants endcap." It seriously makes a "Z" if you were to plot it out. Tweak the end caps and we could be dealing with a compass symbol and an accompanying Freemason conspiracy on variants (I will seriously laugh an hour if someone takes that and throws it out on the net...try me). 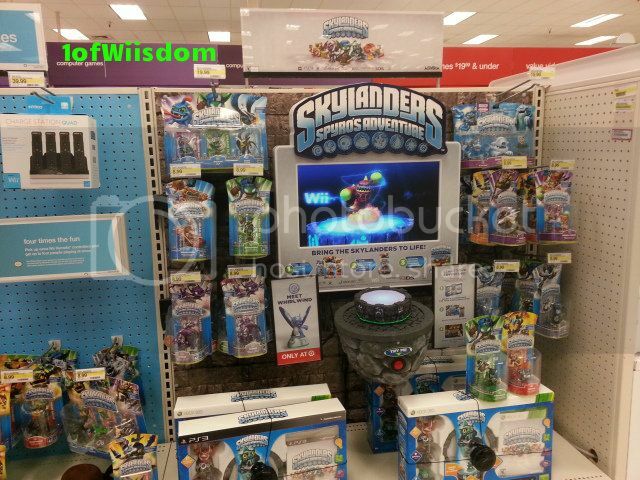 Anyway, as one might expect I got pretty excited when I saw the Granite Crusher (Target Exclusive) display. I immediately tracked down an employee and he said the had told them nothing on that, but that you could reserve a copy of the game. When I hit the store up tonight it was the same layout. Usual location (expanded) and two endcaps diagonal from one another. This is TRU last week. Same set-up as usual, but I did want to note the new backpack and fact that the Legendary Triple Pack was back...last triple pack on left side, bottom. I wondered where they would put the Giants stuff, and just assumed it would be next to this set-up and possibly across the store like last year at launch (again let me hearken back to the glory days of October 2011 when the game launched and it wasn't popular yet. Activision sunk some serious cash into all that display space and they literally had not only what you see above (full row), but also a wall on the opposite side with the stone pegboard going up to so high you could spot it from anywhere in the store). I wasn't sure what to think when I walked in to TRU tonight and the display I just took pics of last week was GONE. I figured it had been moved and immediately thought of the same corner they had last year (my store it is where the seasonal pools/playground stuff was). On my way there, I saw that above site. There was just two rows of Triples and then all the bare hooks. 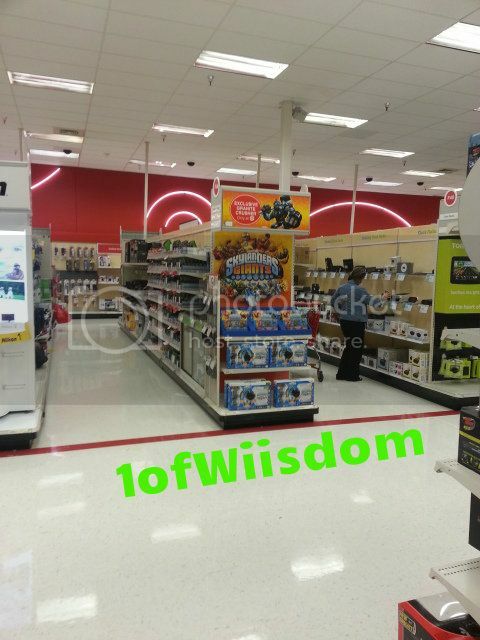 You can't really see it from here, but the rest of the stock from last week's photo is now up against the wall you see this isle being perpendicular to...Not the best set-up, and it is honestly a downgrade from just the spot last week, but I suppose I'll get a feel for things soon. I don't know if the Wii U carved out some hallow ground or Activision spec'd out endcap city this year or what, but this isle is much less noticeable than what they just left at my TRU. All that thrown aside, this is probably what you really care about...What are all those vacant hooks tagged? And what is that stuff on the far left? Fear not...I've got you covered! So there you have it...a lot can change within a week. Target and Toys'R'Us went from the same ol' thing to something totally new and different. 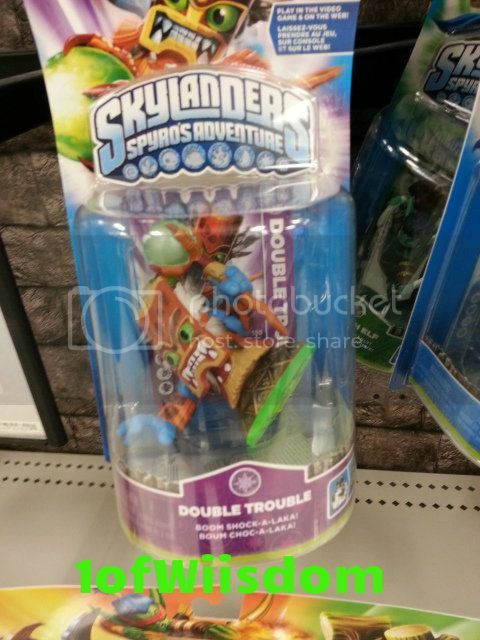 Target will be getting Granite Crusher and TRU will not only have the Legendary Triple Pack on Launch Day, but will also have the Legendary Singles of Stealth Elf and Bouncer! For what it is worth, the controllers actually don't look bad. 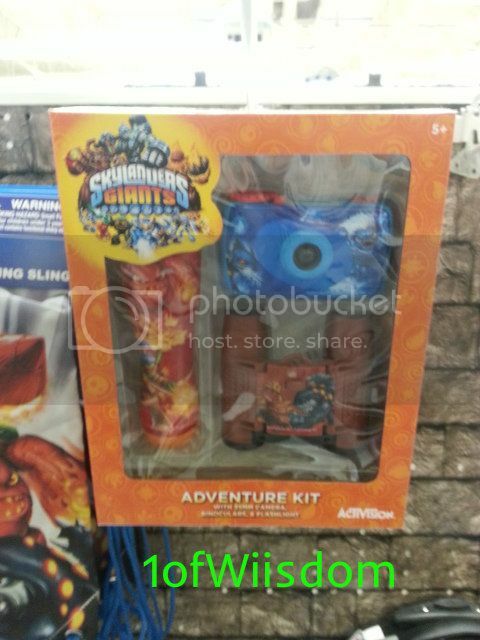 The Adventure Kit will probably be a hit with a few kids and the quality might be better than I'm guessing, but that is one of the "reaches" imo. For those interested the flashlight seems to have Fire Element Eruptor and Flameslinger, the camera has Water Element Zap and Slam Bam, and the binoculars have Earth Element Bash and Terrafin. 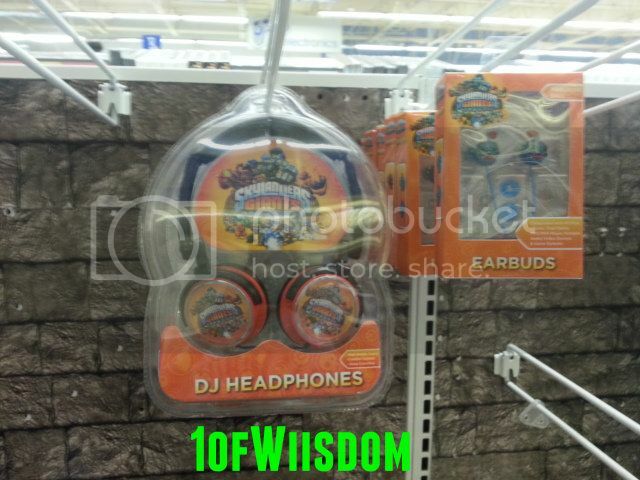 Yep...DJ Headphones and Earbuds. The headphones just have the Giants game logo, while the earbuds (I did skim back) are all Wrecking Ball. I guess I could see him rocking out, but just looking at them seems painful as you imagine them going in your ears. Having had experience with this stuff as a kid, I am guessing the quality is subpar, if not abysmal. I would love to be wrong and if I am these will not only be a hit with kids, but also a great gift that is both enjoyed and practical. Seeing all this really kind of cemented my stance to just focus on the basics this time around. I'm still debating if I'll get Series 2 Skylanders or stick to what I've got and go for Giants, LightCore, and Legendaries. I'm set on Legendaries just because I got connected with them in SSA. The LightCore I think is a cool new feature that is totally different form the base figures, and the Giants are new and will offer different gameplay. If I wind up with regular S2 it will be because I either really like the character (Terrafin for example), really like their new pose (Ignitor), or just wind up with so many by trying to save (triple pack > single pack) that I'm not that far from completing the set. I am still anxious to see how the stock pans out. Did Activision REALLY step-up production this time around to try and cover demand, or did they just say that to try and save face and will short produce to keep "hype." If my LightCore pre-order is correct and they really all come out 10/21 and with 5 Legendaries for sure going to be out launch day I am kind of inclined to believe them...at least with this initial run. Anyway, we are now 10 Days out from Giants!! I'll keep you posted as I learn more and be on the lookout for a comprehensive Giants post as well as me updating the generic Giants info thread I made eons ago (haha, get it? Eons ago?). Okay, on that note it is 3:46 AM and I had better get some rest. Post up if you've found anything cool or gotten inside info from someone! Nice, a few people have wound up with the game thanks to mgr. over rides. The Battle Pack you saw is the real deal, everyhwere will have it except GameStop that gets the Golden one...In all honesty, I kind of like the regular coloring better. Congrats on the close encounter though...I keep trying but my stores only have the Giants merch out (headphones, flashlight, ear buds etc). Which Mario games do you have? 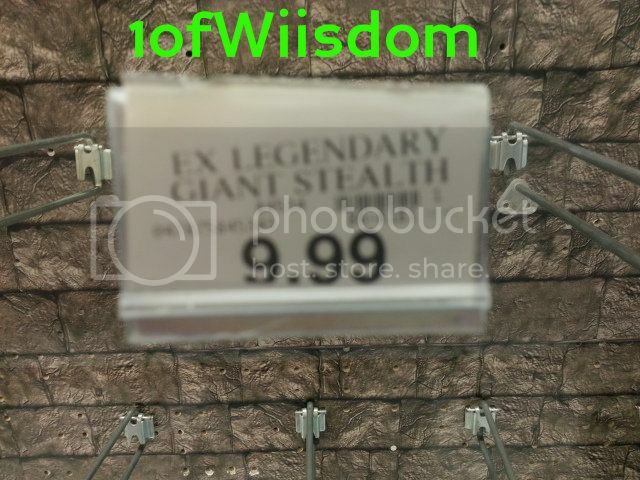 What's the date giant will come out? Giants comes out Sunday, October 21st here in the US...or in 2 days!! I've got a ton of Mario games...check the link to my library on the RH Side. Pretty much all the Wii and 3DS offerings...a few of the DS offerings, and most of the VC titles. I will try and update my library posts soon. 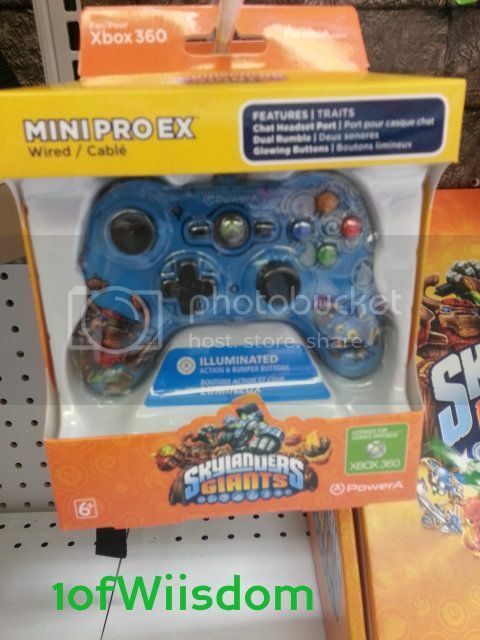 Skylanders run out quickly. Always out of stock where I'm at. Activision is making a lot of money. On chop chop does which path is better for him. Yep, this has been a cash cow for them no doubt. For Chop Chop I'd take the sword path, definitely the better of the two imo.